The 56th Regiment of Foot was raised in 1755 as the 58th Foot, but was renumbered 56th Foot the following year when two of the intervening regiments disbanded. In 1782, it was affiliated to the county of West Essex to become The 56th (West Essex) Regiment. In December 1836, the 56th was permitted to bear the word "Gibraltar" on its Colours in commemoration of its distinguished service in the defence of Gibraltar in 1782. 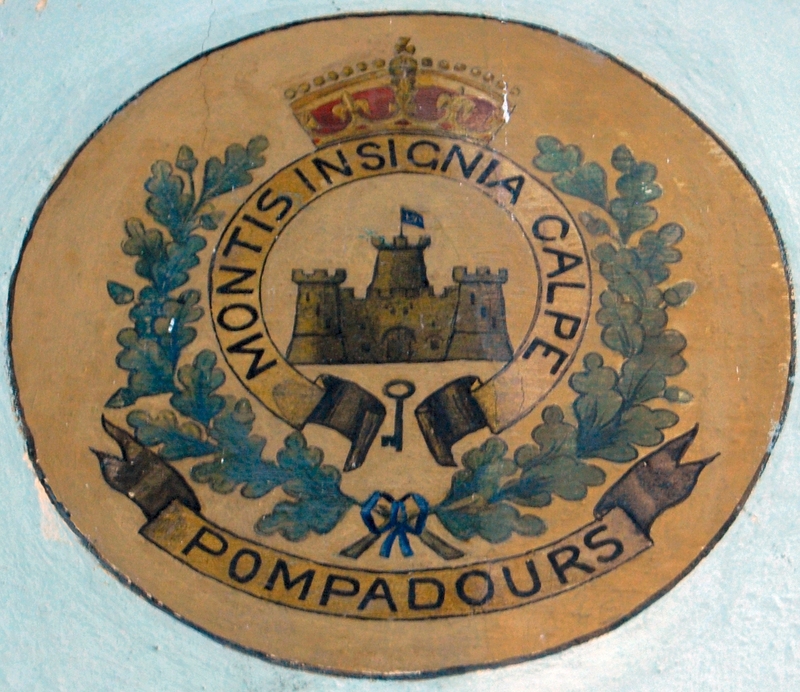 It also displayed the Castle and Key, being part of the armorial bearings of that fortress, together with the motto Montis Insignia Calpe. On 1 July 1881 The 56th (West Essex) Regiment merged with the 44th (East Essex) Regiment of Foot to form The Essex Regiment. 22 July 1878 An Expeditionary Force under General Sir Garnet Wolseley landed in Larnaca and took over Cyprus. 1 July 1881 The 56th Regiment became The 2nd Battalion The Essex Regiment. 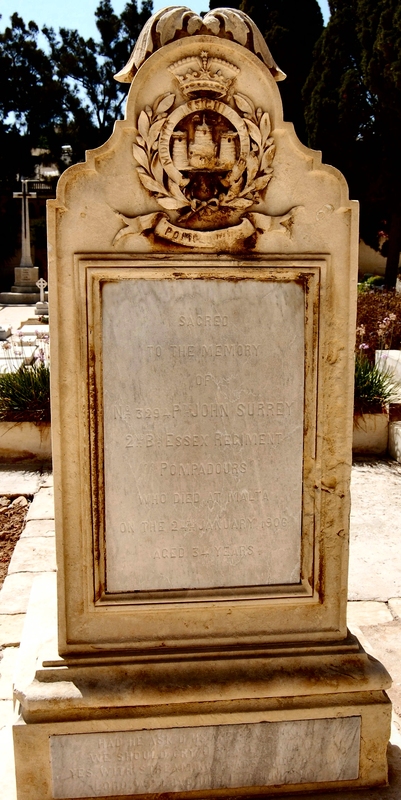 27 Feb 1887 The 2nd/Essex Regiment embarked in Egypt and arrived int Malta on 3 March 1887. The 2nd/Essex Regiment had an average strength of 688 men. It had 340 admissions (494.1/1000 mean strength) into hospital with 3 deaths (4.35/1000 mean strength). 2 invalids returned to England. Its average constantly sick was 18.43 (26.78/1000 mean strength). The average sick time to each soldier was 9.77 days. The average duration of cases of sickness was 19.78 days. 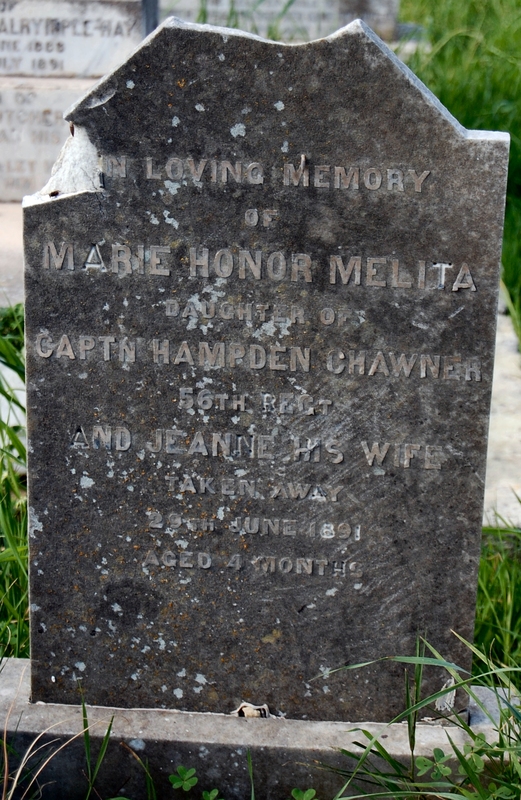 7 July Constance Mead daughter of Charlotte and Gnr Master Sgt Moses Mead, of Isola Gate, born on 14 June 1887. 7 Aug Katherine Gambles daughter of Emma Agnes Gambles and Sgt Drm Thomas Gambles, of St Paul's Bastion, born on 25 July 1887. 2 Oct Albert Harold Mant son of Henrietta and CSgt Frederick Mant of St Nicholas Bastion Quarters Cottonera, born on 5 Sep 1887. 9 Oct Arthur Edward Sullivan son of Emily and CSgt Jeremiah Sullivan of St Paul's Bastion Quarters Cottonera, born on 2 Sep 1887. 9 Oct Joseph Henry Rose son of Caroline and CSgt Henry Rose of St Nicholas Bastion Quarters Cottonera, born on 14 Sep 1887. 13 Nov Maud Kimm daughter of Clara Matilda and Army School Master David William Daniel Kimm, of St Paul's Bastion, born on 24 Sep 1887. The 2nd/Essex Regiment had an average strength of 924 men. It had 466 admissions into hospital with 3 deaths. 9 invalids returned to England. Its average constantly sick was 24.94. The average sick time to each soldier was 9.87 days. The average duration of cases of sickness was 19.58 days. The HQ was at Floriana. The battalion was at Valletta and Cottonera with detachments at Forrest Hospital and Citta Vecchia. 24 June Oscar William King son of Elizabeth Ann and L/Sgt Henry John King, born on 22 Dec 1887. 4 Sep Marguarite Melita Godfrey daughter of Jane Hannah and Bandmaster William Godfrey, born on 14 Aug 1888. 3 Oct Alice Varab Coughlan daughter of Elizabeth and Paymaster Sgt James Coughlan, born on 8 Sep 1888. 6 Nov Gerald William Plant Kimm born 18 Sep 1889, son of Clara Matilda and Army School Master David William Daniel Kimm of Upper St Elmo Valletta. 28 Nov Charles Frederick Gambles son of Emma Agnes and Sgt Drm Thomas Gambles, born on 6 Nov 1888. 19 Dec Harold Leslie Sullivan son of Emily and CSgt Jeremiah Sullivan of Floriana, born on 17 Nov 1888. 22 Jun Sgt Frederick Gale aged 25 years. 19 Nov Sgt George Payne aged 30 years. 24 Nov L/Cpl Richard Dulieu aged 24 years. The 2nd/Essex Regiment had an average strength of 677 men. It had 280 admissions into hospital with 2 deaths. 13 invalids returned to England. Its average constantly sick was 17.85. The average sick time to each soldier was 9.63 days. The average duration of cases of sickness was 23.27 days. The 2nd/Essex Regiment was at Floriana Barracks and Citta Vecchia for 12 months. 11 June Gertrude Ethel Thomas born 12 January 1889, daughter of Elizabeth and Pte Henry Thomas. 7 July Charlotte Archer Mead born 27 May 1889, daughter of Charlotte Archer and QM Sgt Moses Mead. 17 Aug Elsie King born 27 July 1889, daughter of Elizabeth Ann and Sgt Henry John King. 20 June At Pietà Military Cemetery, Gertrude Ethel Thomas aged 5 months, daughter of Pte Henry Thomas. 23 July 1889 The 2nd/Essex left for Cyprus leaving four companies in Malta; another 155 men embarked for Cyprus on 9 December. 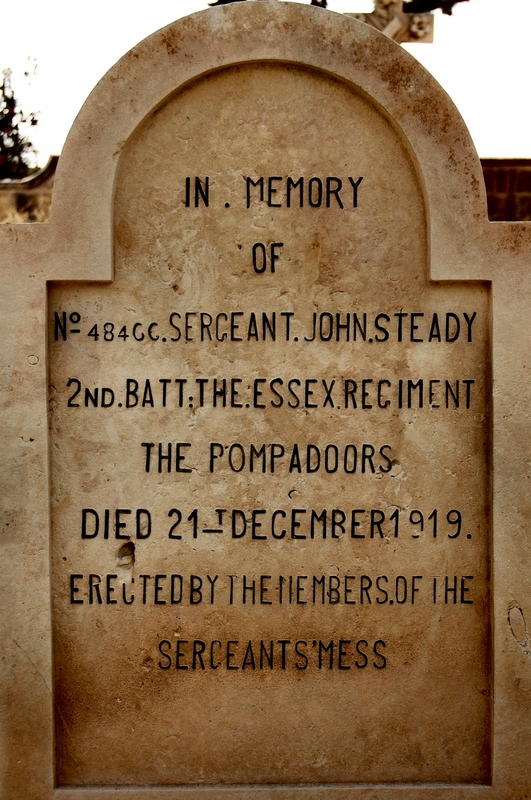 1 Jan–1 June 1890 The main body of the 2nd/Essex Regiment was in Cyprus with a detachment of 4 coys in Malta. It left Cyprus for Bombay on 8 October 1892. It had an average strength of 254 men. It had 158 admissions into hospital with 4 deaths. 3 invalids returned to England. Its average constantly sick was 9.16. The average sick time to each soldier was 13.16 days. The average duration of cases of sickness was 21.16 days. The detachment was at Fort St Angelo for 12 months. 27 Apr Sidney Arthur Rowe born 25 Mar 1890, son of CSgt Arthur Alfred Rowe. 1 June Constance Ada Swan born 30 Apr 1890, daughter of Sarah Emily and CSgt Stephen Swan. 10 Feb Leslie Sullivan aged 1 year 3 months, died at Fort St Angelo. 21 July C W Hicks aged 23 years, died at Cottonera Hospital. 29 Aug W Thoroughgood aged 21 years, died at Cottonera Hospital. 11 Sep Herbert Roe aged 21 years 7 months, died at Fort St Angelo. 17 Nov H Hooper aged 25 years, died at Cottonera Hospital. 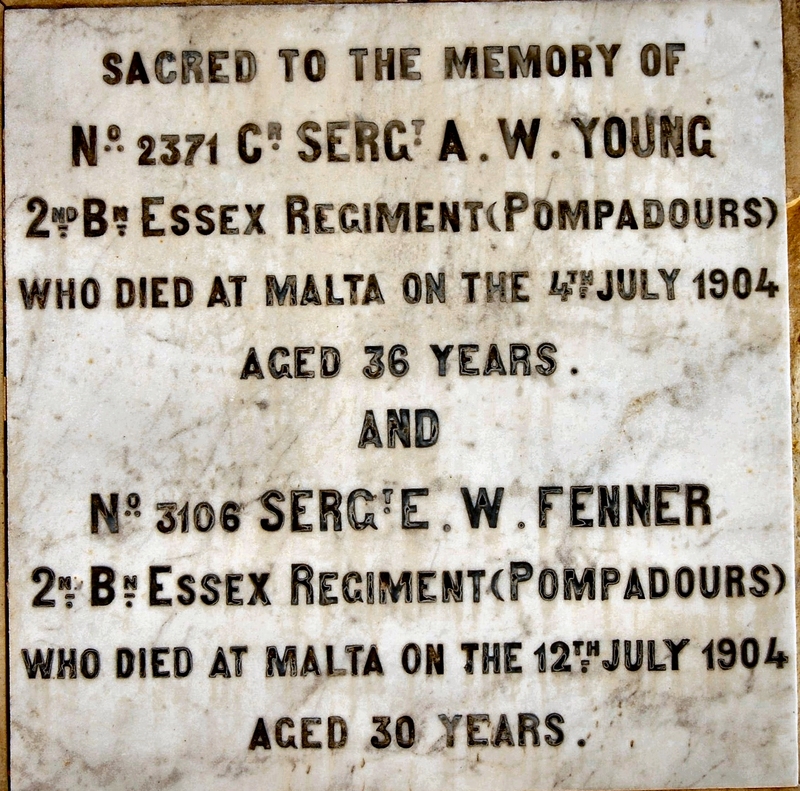 The 2nd/Essex Regiment was in Cyprus with a detachment of 4 coys at at Fort St Angelo and Vittoriosa. It had an average strength of 389 men. It had 276 admissions (709.5/1000 mean strength) into hospital with 6 deaths (15.42/1000 mean strength). 11 invalids returned to England. Its average constantly sick was 20.28 (52.13/1000 mean strength). The average sick time to each soldier was 19.03 days. The average duration of cases of sickness was 26.82 days. The detachment was at Fort St Angelo and Fort San Salvatore for 11 months and in Gozo for a month. 7 Jan Lilian Mary Latina Spencer born 1 Dec 1890, daughter of Lilian and Capt John Trevor Spencer of 6 Piazza Miratore Floriana. 21 Jan Noel Alfred Gambles born 22 Dec 1890, son of Emma Agnes and CSgt Thomas Gambles. 24 May Louisa Foreman born 23 Apr 1891, daughter of Jane and Sgt Arthur Richard Foreman. 25 Oct Baptism of Charles George Kimm born 20 Aug 1891, son of Clare Matilda and Army School Master David William Daniel Kimm of Fort Upper St Elmo. 13 Mar William Evans aged 26 years, died at Cottonera Hospital. 4 May William Fox aged 25 years, died at Cottonera Hospital. 23 July Leslie Dyson aged 9 months, died at Fort Salvatore. 7 Sep William Cockerton aged 26 years, died at Cottonera Hospital. 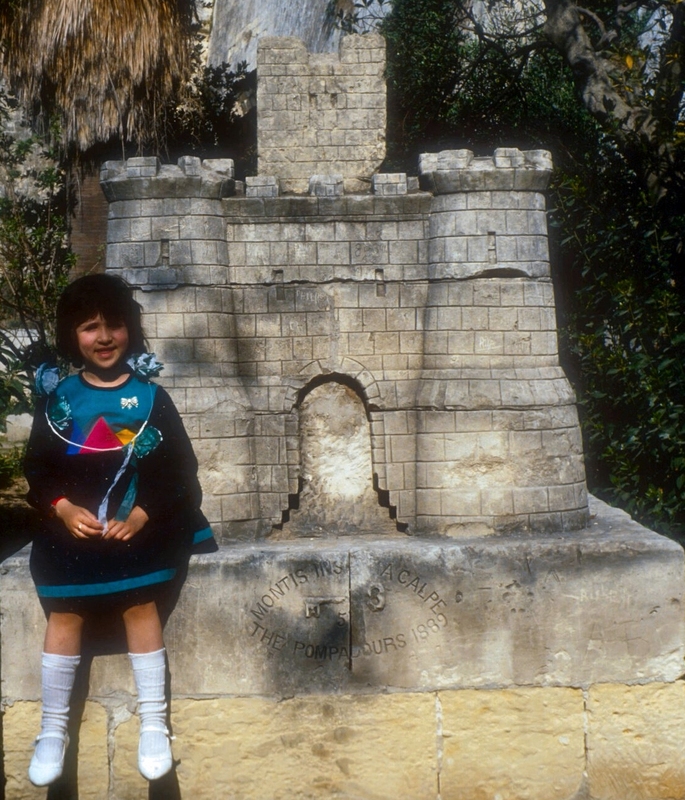 19 Oct Louisa Foreman aged 7 months, died at Cottonera. 26 Oct Francis Binks aged 25 years, died at Cottonera. 27 Oct James Brown aged 22 years, died at Cottonera. 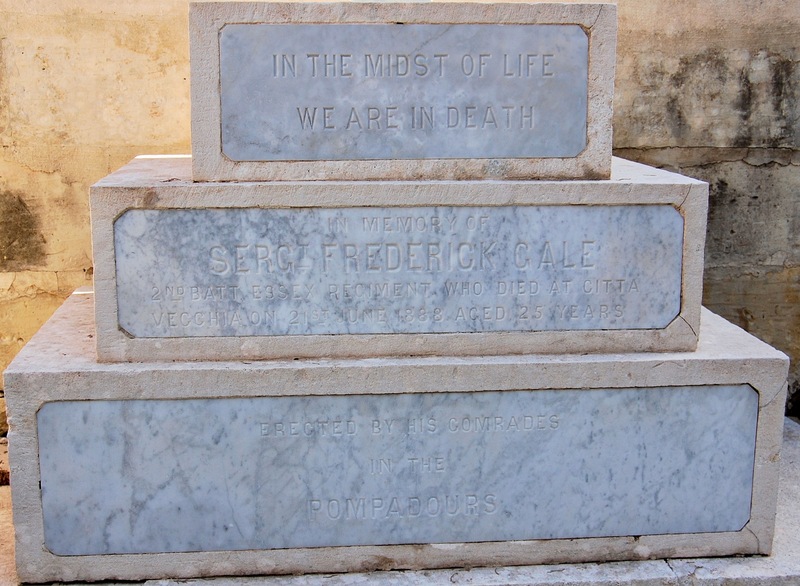 2 Nov George Gumage aged 23 years 6 months, died at Cottonera. The 2nd/Essex Regiment had an average strength of 364 men. It had 175 admissions (480.8/1000 mean strength) into hospital with 6 deaths (16.48/1000 mean strength). 3 invalids returned to England. Its average constantly sick was 10.58 (20.06/1000 mean strength). The average sick time to each soldier was 10.60 days. The average duration of cases of sickness was 22.23 days. The detachment was at Fort Chambray Gozo for 9 months. 28 Sep 1892 The 2nd/Essex embarked for Bombay, leaving in Malta a depôt detachment of 67 men. 18 Aug Reginald Sydney Stanley born 17 July 1892, son of Alice Fursman and Orderly Room Sgt Reginald Stanley of Gozo. 30 Aug Oscar John Scott born 27 July 1892, son of Alice and Sgt William Oscar Scott of Gozo. 30 Aug William Arthur Swam born 12 Aug 1892, son of Sarah Emily and CSgt Stephen Arthur Swam of Gozo. 27 Apr 1893 Burial of William Mills aged 5 months, in Rinella Military Cemetery. He died in Cottonera. Sep 1893 The Depôt Detachment of 67 men left Malta. 19 Apr 1904 The 2nd/Essex left Warley and embarked at Southampton on the Sicilia. It arrived in Malta on 28 April. The battalion moved into Lower St Elmo Barracks. Six companies remained at this location throughout the year except for short periods at Pembroke, Mellieha and Ghajn Tuffieha Camps. They returned from Ghajn Tuffieha Camp on 19 December. 29 Apr–1 Sep "A" Coy and "B" Coy were in Fort Chambray Gozo. They were relieved by "D" Coy and "F" Coy which remained there until 8 May 1905, when they were relieved by "C" Coy and "E" Coy. 1904 The regimental strength was 698 men. In June, 9.6% of their strength was admitted with "simple continued fever"; in July 35%; in August 5%, in September 6.3% and in October 6%. That is 55% of the regiment was attacked with "simple continued fever" during the first summer of their residence in Malta. 7 July CSgt Alfred William Young, aged 36 years. 7 July L/Sgt Herbert Howe, aged 33 years 2 months. 13 July Sgt Enos W Fenner, aged 31 years 10 months. 19 July L/Cpl Arthur Warrick Hibbit, aged 20 years 9 months. 10 May Charles William Abbott, aged 8 months, son of LCpl G. Abbott 2nd/Essex Regiment. 12 Nov Pte Walter Pilne, aged 20 years. 16 Nov William Henry Smith, aged 2 years. 8 May 1905 "F" Coy returned from Gozo and occupied Lower St Elmo Barracks. It remained at this location until 8 July 1905, when it marched to Mtarfa Barracks. There, it replaced the 2nd/Royal Sussex Regiment. Lower St Elmo was taken over by the 1st/Lancashire Fusiliers on 11 July. While at Mtarfa, the Essex Regt had three cases of Mediterranean Fever. These occurred on the 13th, 24th and 28th July. 24 Sep Sgt William Terris aged 29 yrs 9 mths. 19 Oct Infant Violet Mary Hills aged 9 hours, daughter of Sgt Hills. 9 Jan Sgt Wooles Saye, aged 34 years. 5 Feb Pte Bernard Rochester, aged 20 years 4 months. 6 Feb Pte Arthur Barnard, aged 20 years 2 months. 5 Mar Pte John Lamb, aged 19 years 7 months. 18 Oct Pte William Henry ...., aged 19 years 9 months of Mtarfa. 25 Jan Pte John Surrey aged 33 years. 12 July Infant Ada Elizabeth Bloomfield aged 4 months, daughter of Sgt Bloomfield. 24 Mar 1907 The 2nd/Essex Regiment left for Southampton on the Braemar Castle. It arrived in Dublin on 3 April 1907. 9 Sep 1919 The 2nd/Essex arrived at Malta. It had 26 officers, 820 rank and file. 1 Jan 1920 Strength: 26 officers, 810 rank and file. 12 Nov Ronald Frank Malyon son of Flora May and Sgt Drummer Frank Percy Malyon of St George's Barracks, born on 12 Nov 1920 was baptised at the Imtarfa Church Room. 14 Nov 1920 Dorothy Marion Jacob daughter of Elizabeth and Pte Herbert William Jacob of St Tigne Barracks, born on 12 Nov 1920 was baptised at the Imtarfa Church Room. 1 Jan 1921 Strength: 25 officers, 883 rank and file. 1 Dec The 2nd/Essex left Malta by December 1921.